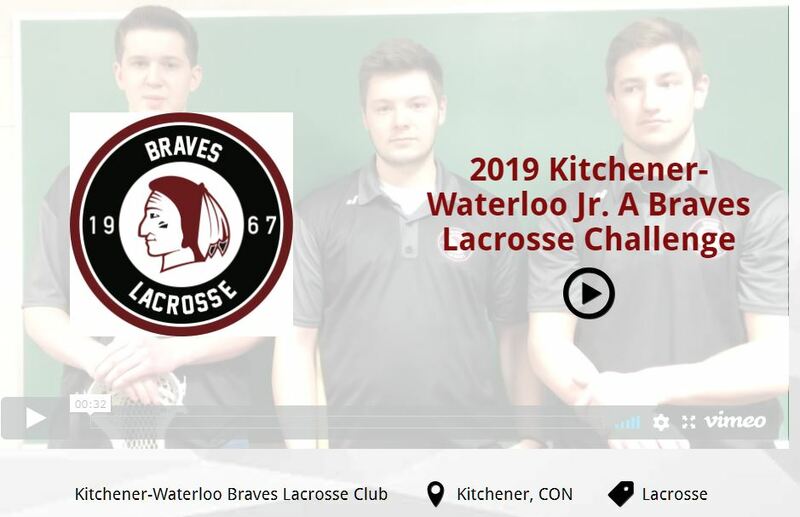 KW Braves Junior A Lacrosse | Turning out pros since 1967. 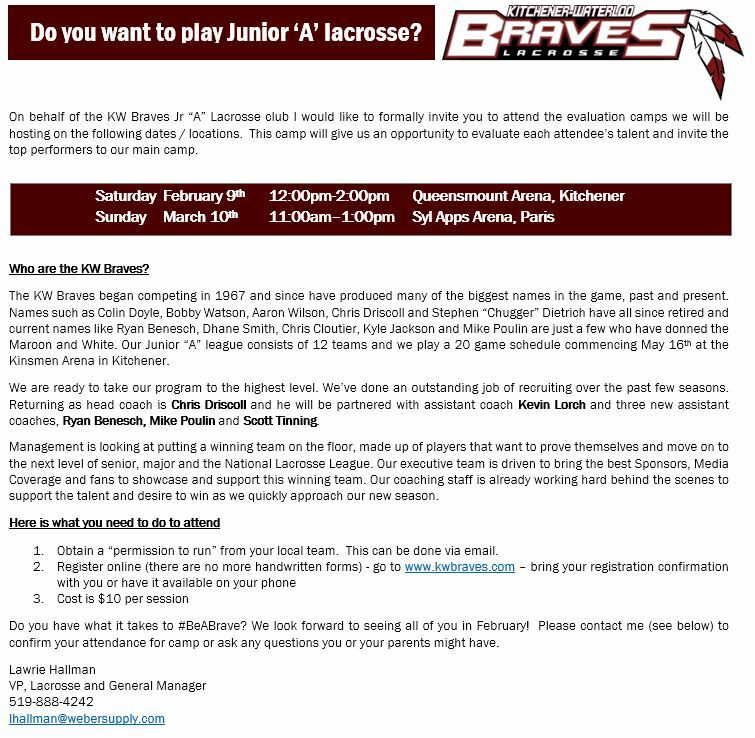 Member of the Ontario Junior 'A' Lacrosse League, the most elite amateur lacrosse league for Junior aged players in the world. The KW Braves are pleased to announce they have made a trade that brings Nate Braniff of the Burlington Chiefs to the KW Braves in exchange for a draft pick and cash. Nate is currently attending university in Baltimore at UMBC and plays lacrosse for the UMBC Retrievers. Can’t wait to see you in the lineup in May. Welcome to the Braves Nate !!! Join our growing list of donors !! Click here to go to sponsor page. 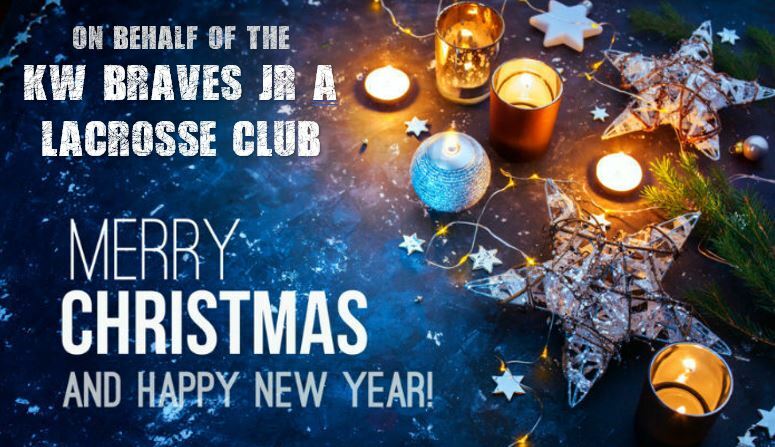 The Braves thank-you for your support. 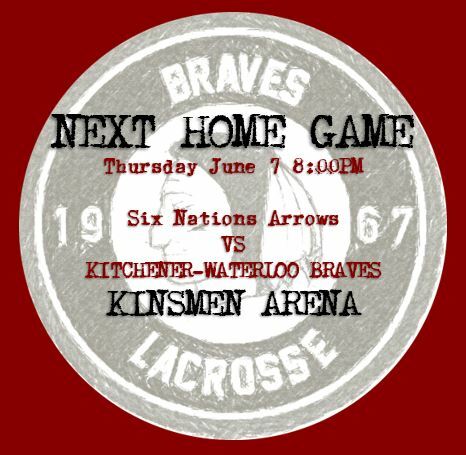 The KW Braves began competing in 1967 and since have produced many of the biggest names in the game, past and present. Names such as Colin Doyle, Bobby Watson, Aaron Wilson and Stephen “Chugger” Dietrich have all since retired and current names like Ryan Benesch, Dhane Smith, Chris Cloutier, Kyle Jackson, Chris Driscoll and Mike Poulin are just a few who have donned the Maroon and White. 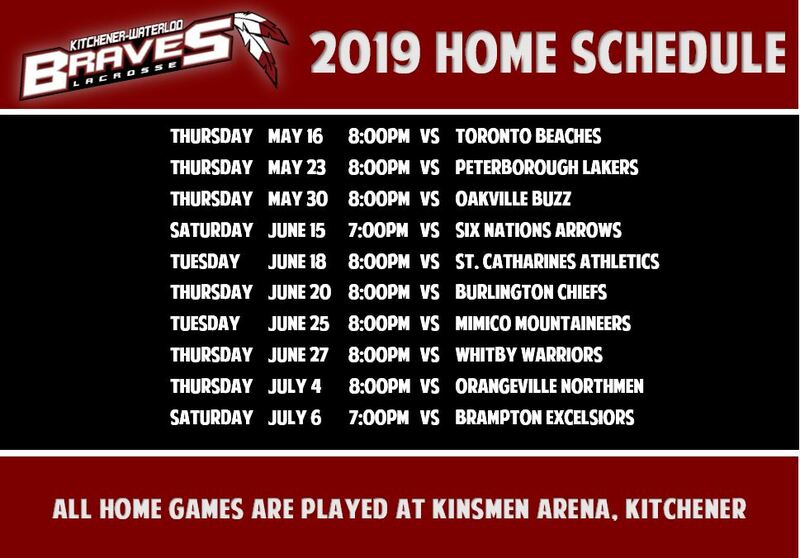 Our Junior “A” league consists of 12 teams and we play a 20 game schedule commencing May 16th at the Kinsmen Arena in Kitchener. We are ready to take our program to the highest level. We’ve done an outstanding job of recruiting over the past few seasons. Returning as head coach is Chris Driscoll and he will be partnered with assistant coach Kevin Lorch and three new assistant coaches, Ryan Benesch, Mike Poulin and Scott Tinning. 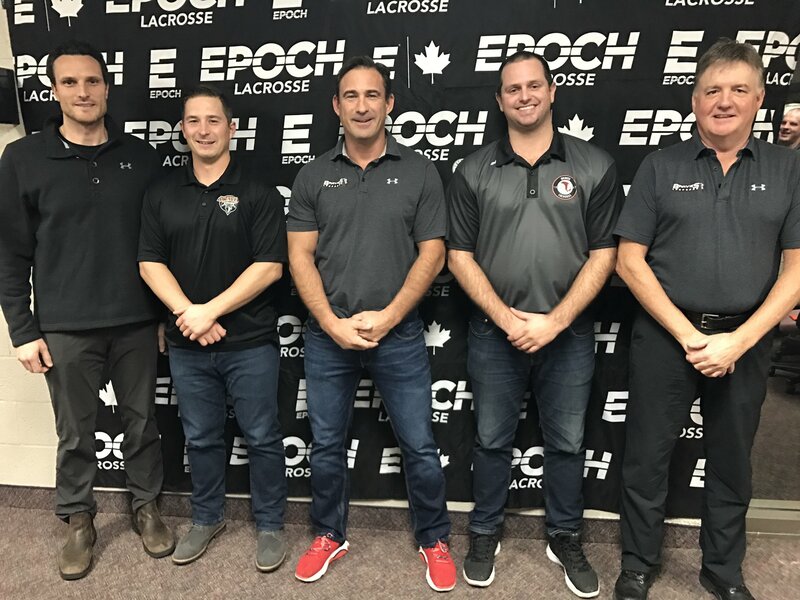 Management is looking at putting a winning team on the floor, made up of players that want to prove themselves and move on to the next level of senior, major and the National Lacrosse League. Our executive team is driven to bring the best Sponsors, Media Coverage and fans to showcase and support this winning team. Our coaching staff is already working hard behind the scenes to support the talent and desire to win as we quickly approach our new season. Your donation is greatly appreciated. Your donation will contribute towards expenses required for LAX balls, game day attire, end of the year banquet/awards, practice uniforms, game uniforms, travel expenses, pre/post-game meals, LAX heads for sticks, equipment bags, arm guards, shoulder pads, rib protectors, balls, helmets, gloves and goalie gear. 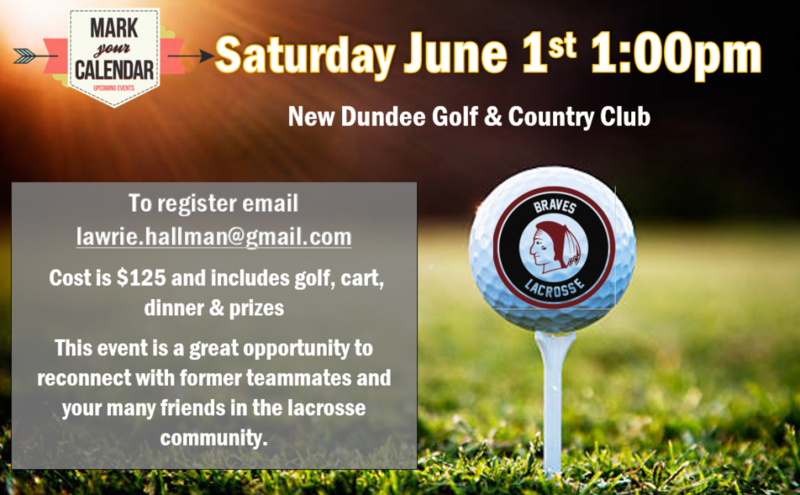 With your help we can continue to advance and improve our lacrosse program! 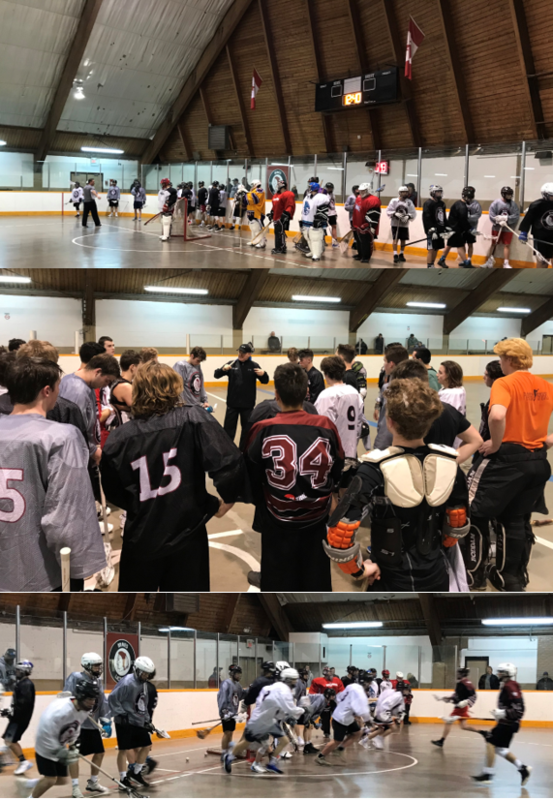 This season we will participate in an intensive lacrosse training program including defensive drill work, offensive drill work, agility exercises, throwing, passing drills, offensive and defensive team concepts, catching drills, dodging drills, wall ball drills and ground ball drills. The KW Braves would like to welcome Andy Borgatti to our team. 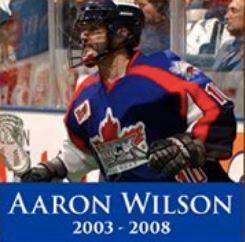 Andy was acquired from the Brampton Excelsiors for a second round draft pick and financial considerations. Borgatti, a defensive specialist is coming off a successful year with the Excelsiors as they went onto win the Ontario Championships and were runners up in the Minto Cup. We are more than excited to have Andy in our lineup. Welcome aboard. Passed away peacefully after a brief illness, with family at his side on Thursday, January 3, 2019 at Freeport Hospital at the age of 75. Beloved husband of Mariane (nee Mannen) Grau for 47 years. Dear brother of Rich and his wife Jo-Ann and dear uncle of Jordan (Jacqueline) and Zachary. Terry will also be missed and remembered by his brother and sister-in-law Carolyn and Jim Barbour and their family Wylie and Chad and Bette and Murray Sholer and family and sister-in-law Lynn Mannen. Predeceased by his parents Peter and Eleanor (nee Tschirhart) Grau and his mother and father-in-law Erma and Robert Mannen and brother-in-law Douglas Mannen and niece Lauren. Terry retired from MPAC after 30 years of service. 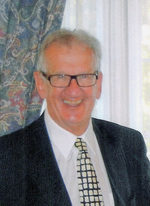 He had a love of all sports especially, Hockey, Lacrosse, Golf and Sailing. Terry’s family will receive relatives and friends on Monday, January 7, 2019 from 2-4 and 7-9 pm at the Henry Walser Funeral Home, 507 Frederick St., Kitchener 519-749-8467. Visitation will continue on Tuesday, January 8, 2019 from 12:30-1:15 pm. The Funeral Service will take place in the chapel of the funeral home at 1:30 pm on Tuesday followed by a reception. As expressions of sympathy, donations to Clarky’s Kids would be appreciated by the family (cards available at the funeral home). 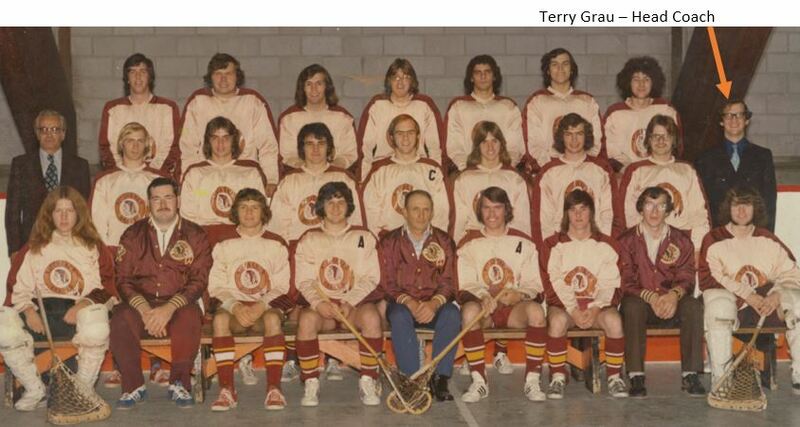 Terry Grau coached the Kitchener Braves in the early 70’s and was instrumental in leading his team to the 1974 Ontario Finals, eventually losing in 7 games to Whitby. Our thoughts and prayers go out to his wife Mariane and brother Rich (former board member). Funeral details will follow. Four goaltenders attended the same National Lacrosse League training camp and all four hailed from Kitchener. Crazier yet, when all was said and done, all four made the team. Mike Poulin will get the starting assignment Saturday night when the Georgia Swarm open their regular-season schedule against New England Wolves at Infinite Energy Arena in Duluth, Ga.
Kevin Orleman will serve as Poulin’s backup, while Steven Orleman and Craig Wende have been assigned to the team’s four-man practice squad. The Swarm unveiled their 21-man roster Monday after an intense two-week training camp that saw the four goaltenders support each other while trying to outperform each other. “I’ve never seen anything like it. The fact there are four goalies from the same city in the entire league would be very rare, the fact we all wound up trying out for the same time is incredible,” said Poulin. Poulin will celebrate his 33rd birthday on Monday, two days after embarking on his 14th NLL season. 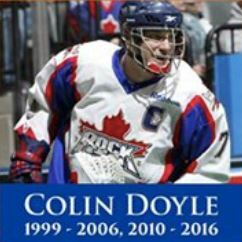 He won a league championship with Georgia two years ago and has also earned individual awards during his storied career that started with the Toronto Rock and included stops with the Boston Blazers and Calgary Roughnecks. Kevin Orleman, 22, has followed Poulin’s career for as long as he can remember and looks back fondly on summer camps and one-on-one training sessions with his future teammate. He also recalls family trips to the Air Canada Centre to see Poulin play and thinking how cool it would be to play the game professionally, with thousands of spectators looking on. “We have a Mike Poulin Toronto Rock jersey from when I was like six years old, so playing with him is like being a kid at Disney World,” said Orleman. Georgia’s top goalies are at very different stages of their lives. Poulin is a married father of three who works weekdays for Waterloo-based Clearpath Robotics before hitting the road on Friday night to join his Georgia teammates. The Swarm’s 18-game schedule features nine games at home, as well as road contests against Toronto, Philadelphia, New England, Rochester, Colorado, Buffalo and Calgary. This week’s schedule includes a 6 p.m. flight to Atlanta, a 9 p.m. practice and a Saturday morning shootaround. He will return home early Sunday morning. It’s a hectic schedule that Poulin doesn’t see himself continuing for too much longer. He has already decided to put an end to his summer season — he played for the Brooklin Redmen this year — and said he will likely leave the winter game behind him in the next year or two. To get his summer fix, Poulin will fill a coaching role with the Kitchener-Waterloo Jr. Braves next year. “I’ve gone from a year-by-year mentality to a day-by-day mentality. Physically, I feel like I can play for a number of years but I want to be there when my kids start playing hockey on Saturday mornings and I feel like I’ve missed out on enough Christmas parties, birthdays and family events,” he said. Orleman is at the other end of the career path. The University of Guelph economics student earned a spot on the Swarm roster last season but was sidelined by mononucleosis and missed the first half of the season. He captured the backup role upon his return but didn’t see any action. He has no idea what to expect this season but has no problem playing behind Poulin and learning the ropes. “I’m not too concerned about my playing time and whatnot, whenever it happens, I’ve got to go in and make the most of it. 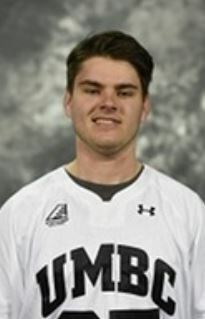 Mike is a talented goalie, one of the best in the league, and I just want to learn as much as I can from him and if I’m called upon, go in and do the best I can,” said Orleman, who played for the Cobourg Kodiaks this past summer. As practice squad players, Steven Orleman, 19, and Wende, 27, are eligible to play in the Ontario-based Arena Lacrosse League and will fly solo to Swarm games as the team’s third-string goaltender. The NLL season, which was delayed for two weeks by a labour dispute, opens this weekend with three games on the schedule. Elsewhere, the Buffalo Bandits take on the Philadelphia Wings and the Vancouver Warriors face the Calgary Roughnecks. Kitchener natives Dhane Smith plays for the Bandits and Chris Cloutier is a rookie for the Wings. Ryan Benesch, another Kitchener product, plays for the Colorado Mammoth and opens his season next weekend against the San Diego Seals. Let’s meet the coaches !!! 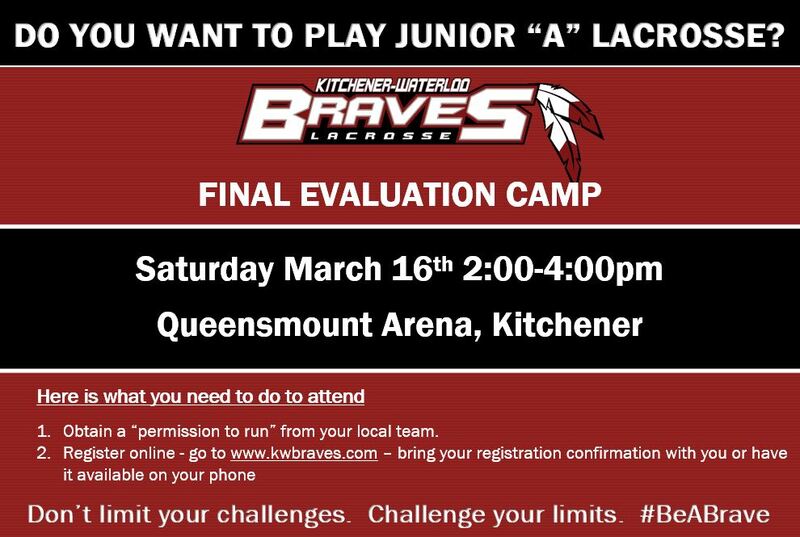 The KW Braves are very pleased to announce the addition of three Braves Alumni to the coaching staff, Mike Poulin, Ryan Bensesch and Scott Tinning. Last night the KW Braves held their 2018 AGM and are pleased to announce our new board of directors. Thanks to those who have helped in the past and welcome to our new members.